James David Lewis-Williams (born 1934, Cape Town) is a South African scholar. He is professor emeritus of cognitive archaeology at the University of the Witwatersrand in Johannesburg. 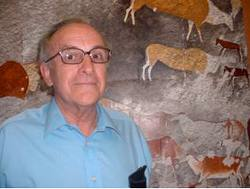 David Lewis-Williams, as he is known to his friends and colleagues, is regarded as an eminent specialist in the San or Bushmen culture, specifically their art and beliefs. His fieldwork studying the Drakensberg rock art, together with a close analysis of the Wilhelm Bleek & Lucy Lloyd Collection, in the 1970s led to his seminal and highly sought after book Believing and Seeing: Symbolic Meaning in Southern San Rock Paintings (published by Academic Press in 1981). This work has fundamentally changed the way many researchers understand San rock art in southern Africa.